Chikungunya is a viral disease that is transmitted by mosquitoes. Its symptoms include high fever, joint pain, headache, nausea, and skin rashes. With this epidemic breaking out even in the remotest of locations, it is important you know about the simple measures that can ease its symptoms. While it is generally not fatal, it can cause a lot of pain and make your body weak. There is no cure for this disease and the after effects can be extremely troublesome. 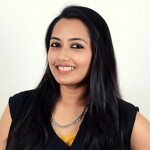 An intervention to relieve the symptoms as well as the after effects is necessary, and what better way to do this than using safe home remedies. The remedies and tips listed in this article will help to alleviate these symptoms and accelerate your recovery from chikungunya. They will also reduce the intensity of the after effects to a large extent. Would you like to know what these home remedies are? Read on! What Is The Chikungunya Virus? What Causes It And How Does It Spread? The US Centers for Disease Control and Prevention identifies chikungunya as a viral infection causes by the chikungunya virus, usually spread by Aedes albopictus and Aedes aegypti mosquitoes. Research is still on to find the right cure for chikungunya. Doctors usually recommend a variety of non-steroidal anti-inflammatory drugs (NSAIDs) and fever-reducing drugs to treat symptoms of the condition (1). Take two capsules per day after your meals. A dosage of one gram per day is sufficient. Continue taking this herb for a few weeks. 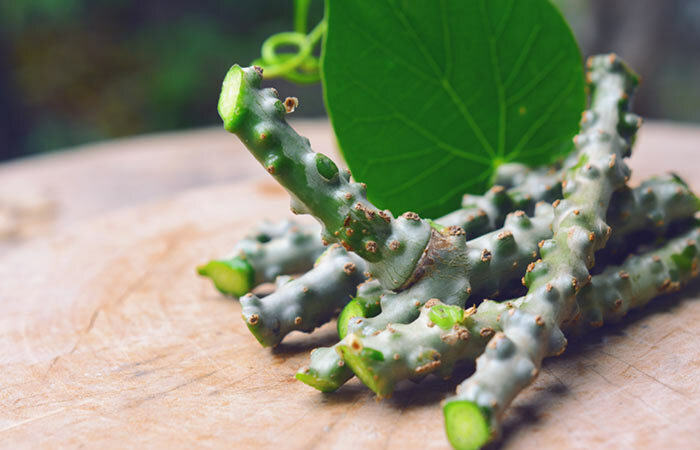 Scientifically called Tinospora cordifolia and commonly known as ‘Guduchi’, this plant is used in Ayurvedic and herbal medications to treat fever associated with different ailments. Its anti-inflammatory, anti-arthritic, and immunomodulatory properties will give relief from the symptoms of chikungunya. It also possesses antimicrobial properties that can aid quick recovery from the infection (3). Giloy should not be given to children below five years of age. Dosage for children above five years should not exceed 250 mg per day. For adults, the daily dosage should not be more than 3 g per day. 1. Wash the leaves and remove the long stem and central vein. 2. Chop the leaves and blend with some water to get a liquidy paste. 3. Strain this liquid and discard the pulp. 4. Drink two tablespoons of this juice every three hours. 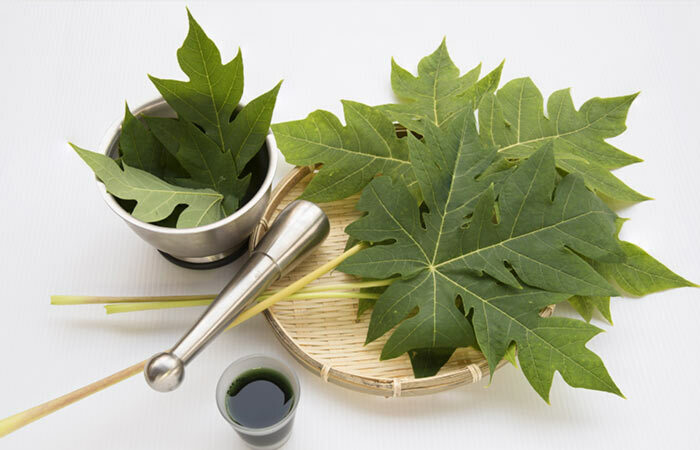 If you cannot find fresh papaya leaves, papaya leaf tincture is also available in the market and can be used. Continue drinking this for 2-3 days. If the symptoms persist, continue for another week. In infections like chikungunya and dengue, the blood platelet count is highly affected. Papaya leaf ingestion has been to shown raise these numbers, thus aiding the body to recover from the infection. This leaf extract also possesses larvicidal properties against the larva of the mosquito that causes chikungunya (4, 5). 1. Peel and chop the garlic. 2. Grind it with water to get a paste. 3. Apply this paste on the affected joints and leave it on for a few hours. Apply garlic paste twice a day. 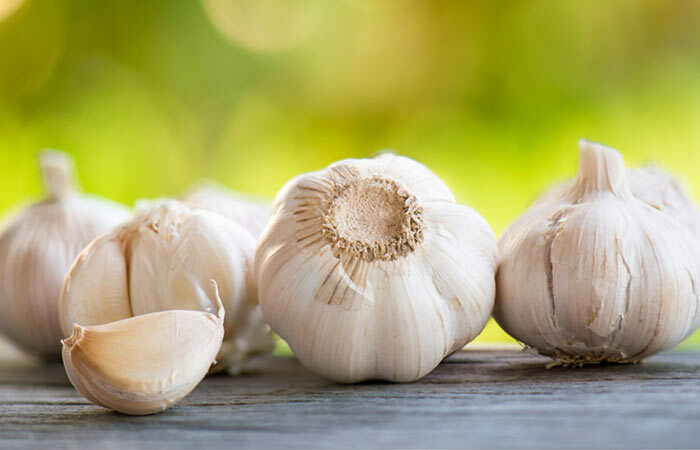 Garlic is often used to relieve joint pain. When applied externally, it alleviates pain and inflammation and also improves circulation (6). 1. 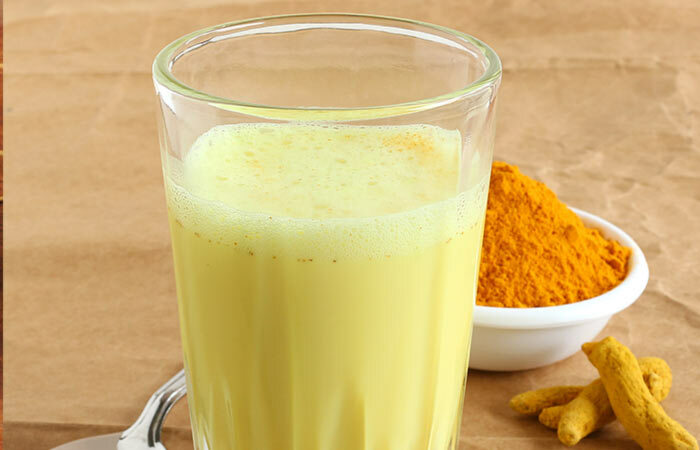 Add turmeric to milk and mix well so that no lumps remain. 2. Drink this while it is warm. Drink one glass in the morning and one before you go to bed. One of the most effective home remedies for a host of diseases, turmeric is also a popular spice in India. Turmeric contains curcumin, a strong antioxidant that exhibits anti-inflammatory characteristics. It makes turmeric an effective home remedy for curing the symptoms of Chikungunya (7). 1. Mix the cayenne pepper in water and heat on a double boiler for 5-10 minutes. Use medium heat. 2. To this, add the beeswax and stir continuously until it has melted and blended well. 3. Remove from the flame and let the mixture cool for 10 minutes in the refrigerator. 4. Stir the paste again to ensure all the ingredients are mixed well. 5. Chill for further 10 minutes and then apply on the affected joints. You can store this paste in an airtight container for 1-2 weeks. Chili peppers are rich in capsaicin, an effective anti-inflammatory agent. Scientific research has proven that this compound reduces inflammation (8). It also relieves pain by blocking the key compound that is responsible for the sending the pain signal to the brain (9). Use gloves while making the paste. Be careful not to touch your face, especially your eyes. 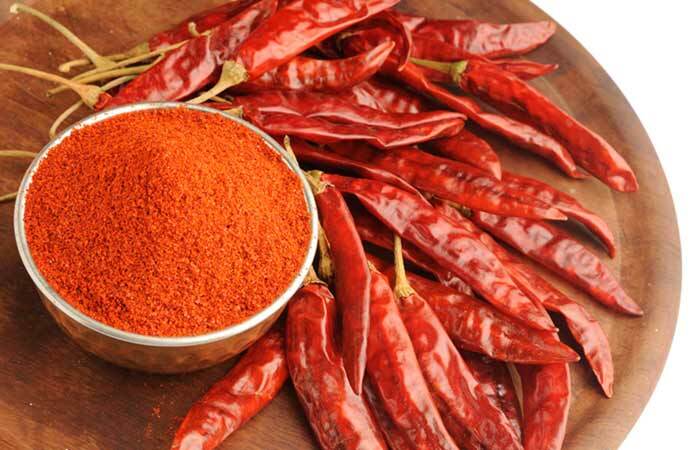 Chili pepper paste might burn slightly, especially if you have sensitive skin. 1. Crush the ice cubes a little and wrap them up in the hand towel. 2. Hold this towel over the joint for a couple of minutes. 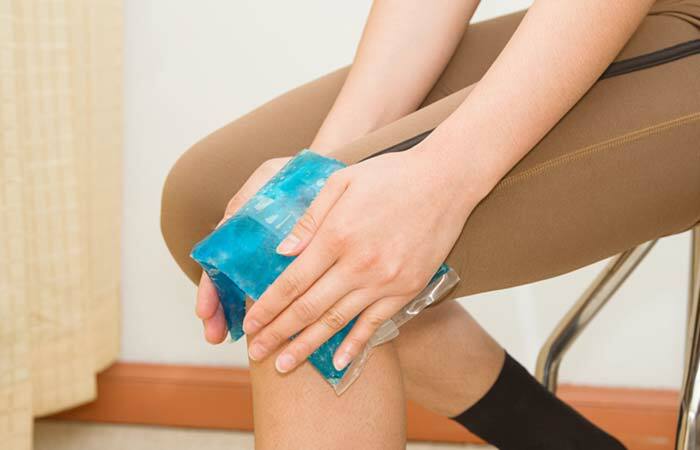 Cold compress is the best way to reduce inflammation, pain, and joint damage. It does so by slowing down the blood flow to the affected area (10). 1. Lightly warm up the oil and add cinnamon powder to it. 2. Mix well and massage the affected joints gently for a few minutes. Reapply the oil twice or thrice during the day. 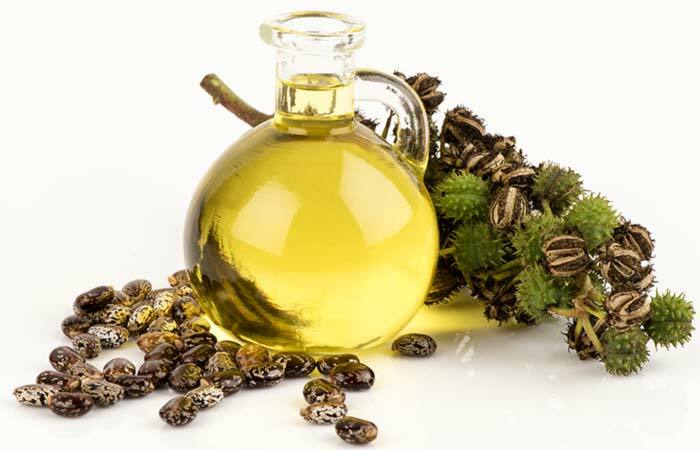 The anti-inflammatory properties of castor oil come handy when it is used to relieve joint pain caused by the chikungunya virus (11). Cinnamon also has anti-inflammatory properties and it aids castor oil in reducing joint pain (12). Chew the grapes and drink the milk along with it. You can repeat this for a day or two. This remedy gives relief from severe symptoms of chikungunya such as pain and fever. 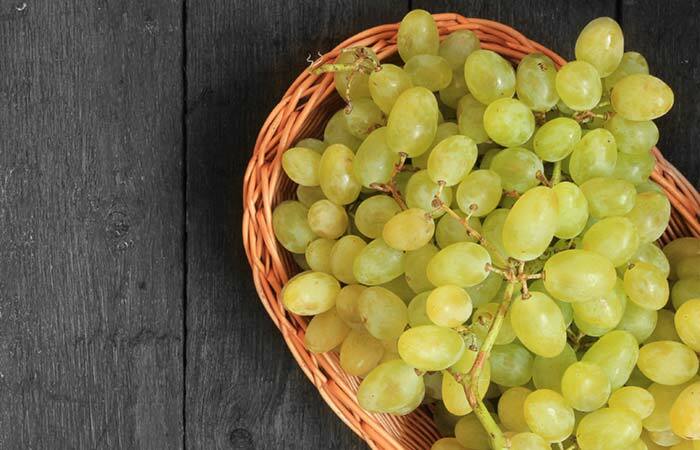 The phenolic compounds present in grapes possess antioxidant and antiviral properties (13). 1. Boil the basil leaves until the water reduces to half. Strain the decoction. 2. Sip this throughout the day. Have basil decoction for a few days. Tulsi (basil) leaves are very effective when they are used to treat chikungunya fever. These leaves reduce the fever and boost the body’s immunity. Their wide range of antimicrobial activity will fasten the recovery process (14). Drink 3-4 glasses of coconut water during the day. Coconut water is a good remedy for the liver as well as the chikungunya virus. 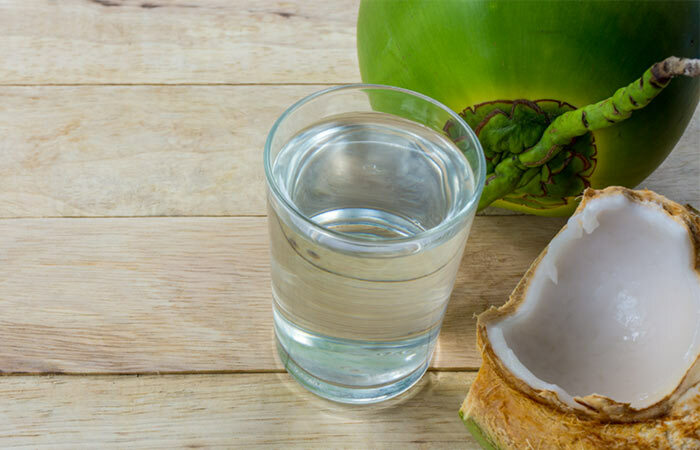 Drinking coconut water is one of the best home remedies for chikungunya treatment as it helps the patients to recover fast by detoxifying the liver. Its manganese content helps in reducing joint pain as it acts as an anti-inflammatory agent (15). Chikungunya might not have a treatment available in the market, but its symptoms can significantly reduced by using the home remedies listed above. Apart from these at-home solutions, homeopathy is also known to work well for Chikungunya symptoms. Rhus Tox – This medication helps in alleviating the joint and back pain experienced with Chikungunya fever. Eupatorium Perfoliatum – Homeopathy doctors prescribe this to treat the severe body pains, chills, and vomiting seen in Chikungunya. Merc Sol – When the joint pains get worse during the night, this medicine is given. Arnica – The joint pains may be accompanied by soreness and blue-black marks on the skin. In such cases, arnica is recommended. Phosphoric Acid – This is used for treating the extreme weakness a patient feels during and after the viral infection. Please consult a registered homeopathic doctor before taking any of these medications. It is imperative you take a few precautions to reduce your chances of contracting an infection (16). Keep all areas around the house clean and hygienic. Do not let any stagnant water remain for too long, for example, in flower vases and water storage vessels. Keep all food and water covered at all times. Do not let stagnant water accumulate in water coolers, pots, and buckets outside the house. Use mosquito repellents both during the day and night as the Aedes is active during daytime as well. Use mosquito nets for babies and children while they are asleep. Wear long-sleeved shirts and pants whenever possible. Let us now look at some facts about chikungunya that should clear most of your doubts. Apart from the signs and symptoms, your doctor will conduct a blood test to ensure that it is chikungunya. Even though the organism that causes dengue and chikungunya is the same and the symptoms appear to be very similar, the two diseases are different. They are caused by two different types of viruses. The joint pain experienced in chikungunya lasts beyond the infection stage, whereas in dengue, joint pain exists only as long as the infection lasts. In chikungunya, rashes develop all over the body. However, they are usually limited to the face and limbs in dengue. Serious complications such as shock, heavy bleeding, and difficulty in breathing are seen only in dengue. Is there a vaccine for chikungunya? No, unfortunately there is no vaccine for chikungunya yet. How long does chikungunya last? It can last from a few days to up to two weeks. However, symptoms such as joint pain and swelling will continue for a year after the initial infection. What to eat during chikungunya? It is essential to keep your body hydrated if you are suffering from chikungunya. To aid quick recovery, the following food items should be included in your diet. Vitamin C has many antioxidant properties. This makes it an ideal nutrient during allergy and infections as it helps in flushing out toxins from the body. The presence of vitamin C triggers the activity of vitamin E, which is essential to reduce pain and inflammation (17). Foods rich in vitamin C are citrus fruits, capsicum, cabbage, pineapple, broccoli, papaya, etc. Leafy greens are one of the best home remedies for inflammation and pain. They contain vitamin E and iron among other nutrients. Vitamin E exhibits antioxidant characteristics that help reduce pain and inflammation. It also helps eliminate cytokines from your body (18). Raw carrots enhance the body’s immune response and also help in protecting against joint pains and aches (19). Ginger helps relieve inflammation. It contains naturally occurring analgesics that mimic Non-Steroidal Anti-Inflammatory Drugs (NSAIDs). Unlike NSAIDs, the analgesics present in ginger have few to nil side effects and are especially effective in dealing with inflammation (20). Omega-3 fatty acids found in fish, almonds, walnuts, etc. are anti-inflammatory in nature (21). How to soothe skin rashes caused by chikungunya? Use a good moisturizing lotion that does not contain any skin irritants to soothe the rashes. You can use natural remedies like aloe vera gel or olive oil to alleviate the dryness and itchiness of the rashes. The chikungunya virus is known to affect the tissues around the joints. The body, in its immune response to this persistent infection, causes inflammation, swelling, and pain in the joints (22). The joint pain can last up to a year after the initial infection. For some people, it can also last for a few years. 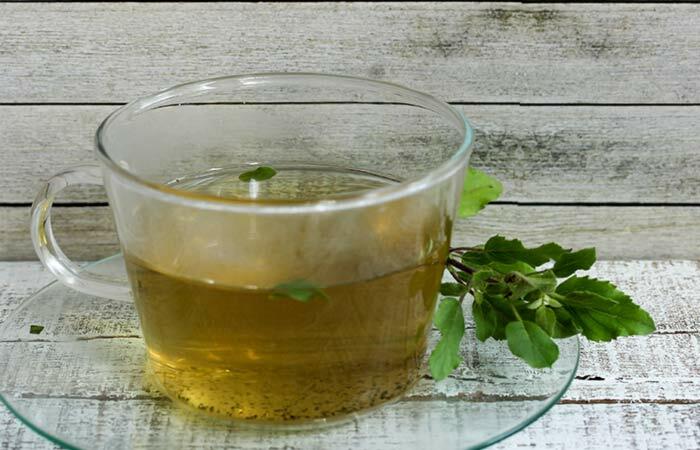 If you are suffering from chikungunya, all you need to do is include the above-mentioned remedies and superfoods in your diet to hit the road to recovery. If you know any other remedies or tips that can help control these symptoms, let us know in the comments section.